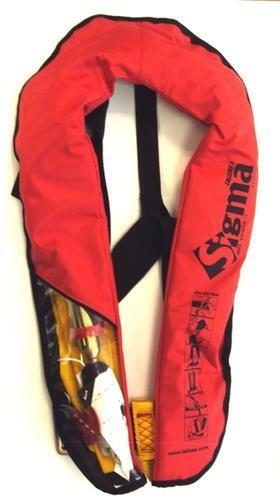 The Sigma life jacket is an economic life jacket available in auto and manual version. The ultra lightweight design makes Sigma comfortable to wear and its webbing system makes it a user-friendly life jacket. This cost effective life jacket is available, in red and its transparent area allows the user to check the operating head function. According to each code, they feature one chamber which can be inflated via Lalizas manual operating head (20220, certified per ISO 12402-7) or via Lalizas auto operation head (20260, certified per ISO 12402-7) and bear oral inflation tube incorporating Lalizas valves (20610, certified per ISO 12402-7). The inflatable bladder, which is manufactured from High Visibility Yellow fabric, is folded into a nylon red valise with Velcro closure and it is also equipped with Lalizas retro reflective tapes (70180) and whistle (70010, certified per ISO 12402-7 8). They are provided with lifting loop and heavy duty D-ring for easier rescue.